There is a still-popular framework in some monetary circles (including parts of the Alt-M crowd) that fiat-money central banks are statist-inflationist redoubts, despite the last 35 years of global disinflation and then deflation, along with falling interest rates. The track record of the last few decades suggests that major fiat-money central banks are actually disinflationist and then deflationist, and appear unwilling to alter course. The old argument was that nations want to pay off debts with cheap money. So nations deploy central banks to print money—the word “debauchery” and “theft” are often used—and pay off bondholders with devalued currency, cheating the lenders of their just due. Of course, today we see Europe and Japan in quicksand-deflation and ZLB, and the U.S. perhaps but one recession away from a similar fate. The sinister statist-inflationist central banks are proving themselves incompetent at printing up cheap money. How can this be? What if the statist central banks are actually very clever? They have figured out that if they can engineer deflation, then nations can borrow in perpetuity for something close to free. Japan, for example, is floating the idea of perma-bonds that pay no interest. And through quantitative easing, nations are paying off national debt without inflationary consequence, as long as central banks can keep deflation as the norm. In Japan, for example, the Bank of Japan owns one-third of that nation’s national debt. Central banks, by keeping interest rates artificially high—remember, with ZLB rates have a floor, despite some negative-interest rates here and there—they can use QE to pay off national IOUs forever. The long road to deflation and ZLB has also resulted in incredible riches for bondholders, who saw their holdings soar in value. Far from being robbed, bondholders have effectively enjoyed three decades of Fat City Boom Days thanks to central banks. Just by chance, I am sure. A good cabal theory is that wealthy and politically influential bondholders, through captive central banks, have engineered an economy-sapping long disinflation and then deflation, extorting rising real rents along the way on soaring bond values. Well, as cabal theories go, it holds more water than the inflation-statist fiat money central banks tale. The woeful record of independent fiat-money central banks and inflation targets is one of nearly universal economic asphyxiation. Everywhere on the globe where a central bank has an IT, one sees inflation below targets, deflation and anemic growth. The Reserve Bank of Australia has an inflation target of 2% to 3%, but with inflation at 1% the RBA is below target. Growth is subpar—and this is the best of the lot. Thailand has a1.5% inflation band around 2.5% IT, and has no inflation and subpar growth. The People’s Bank of China has a 4% IT, and a 1.8% inflation rate. The nation is about at half of real growth rates when inflation was close to target. Japan has a 2% IT, and is in deflation perma-gloom. The Bank of England has a 2% IT, and a 0.3% inflation rate. Growth is subpar. Singapore has exchange-rate target on currencies that are ruled by ITs. The city-state nation most recently posted 0.3% QoQ growth and is in deflation. For that matter the Fed has a 2% IT on the PCE, often misperceived as a 2% ceiling on the CPI (perhaps even by FOMC officials). The Fed is below target and real growth in the U.S. microscopic. What a surprise! At this late date, why does anyone think an IT is a good idea? Where has an IT worked (with the possible exception of the RBA’s IT-band, a slightly less worse idea than an strict IT). The sooner fiat-money central banks kill off ITs the better. They have not worked. Is that not reason enough? Yes, NGDPLT’s would be better. The oddity: For decades, there has been long-winded sermons on the risks of fiat-money central banks, one reason they were made independent. The premise, even in present-day literature, is that central banks have been loose, are loose, and want to be loose, to serve sinister statist-inflationist goals and populist madmen. The reality? Independent fiat-money central banks have universally asphyxiated commerce through tight money. How else to explain gathering global deflation and slow growth? When will macroeconomic orthodoxy accept the reality? Federal Reserve Bankers Victoriously Declare Defeat! Speaking in Beijing a few days ago, Chicago Federal Reserve Bank President Charles Evans said economic stagnation is the new normal and so he sees slow inflation, interest rates and growth for far as the eye can see. Ergo, there is nothing for the Fed to do. For Q1 2016, the index of hours worked nationally in the United States private sector was 112.3. It was 110.2 in Q2 2007, and 109.2 in Q2 2000. That is 16 years of essentially no employment growth in the United States. And look at the 1990s—strong employment growth, and sustained. Yet inflation was moderate throughout the decade. Presently, the PCE core is reading 1.6% YOY. As Marcus Nunes has pointed out repeatedly on these pages, nominal GDP growth has been falling in recent years. There remains a premise in central banker and monetary circles that fiat-money central banks have been “easy” (perhaps for decades) or “accommodative,” and have done all they can do, sometimes wreaking destruction in their path. So now it is time for central bankers to victoriously declare defeat. Central bankers contend that by being so easy for so long, they have driven the developed world into deflation, or close to it. So now, raising rates makes sense. The globe’s major fiat-money central banks are considered “independent,” those being the Bank of Japan, the U.S. Federal Reserve and the European Central Bank. But if inflation everywhere and always is a monetary phenomenon, then so too must be disinflation and deflation. After obtaining the former in the 1980-1990, the major central banks have obtained the latter in the late 2000s over much of the globe, and the U.S. is but one recession away from deflation also. Tyler Cowen, the brilliant blogging polymath from George Mason, recently posited it is politics and the labor class that is pushing the Fed to chronic tight-money, in his recent and welcome endorsement of nominal GDP level targeting by central banks, or NGDPLT. By Cowen’s reckoning, the central banks are independent, except they are cowed by a working class that does not want to see wage cuts through inflation. Does the AFL-CIO stand athwart of Fed desires for NGDPLT, and the attendant moderate rates of inflation? I rather suspect it is strident right-wing academia, think-tankers, punditry and bloggers, and related party politics that have contorted an eagerly compliant Fed into a supine posture now conducive to a deflationary perma-recession. It is rare to see true happiness in this world, but the beam on a central banker’s face when announcing a rate-hike is the best place to look. The Fed has leaned to deflation for decades, and is on the doorstep now. It is benighted, second-rate mythology that the Fed has been “easy” or “held rates low.” If the Fed has been easy, how to explain the 35-year decline in inflation and interest rates? Glad we are to accept a Tyler Cowen into the NGDPLT camp. Maybe for politesse, Cowen must identify the anti-inflation zealots as laborites. So be it. There is still a real danger to American prosperity, even if the Fed adopts NGDPLT, and that is the Fedsters will select a straitjacket tight version of NGDPLT, or chronically miss LT on the low side, as they do with the IT (inflation targeting). The idea of an independent fiat-money central bank may be proving a bad one. In the modern-era, such institutions generally asphyxiate economic growth. The Fed Is Artificially Budging Rates—But Higher Not Lower Does Fiat-Money Central Banking Lead to Deflation? At the always interesting Alt-M website is a post by highly regarded monetary scholar Gerald P. O’Driscoll, pondering if the Fed can raise rates even if it wants to, whether Fed presently is artificially pumping up short-term rates. O’Driscoll notes that today 20 central banks globally have negative interest rates in place. Were now an activist Fed to jack-up the Fed funds rate and the interest on excess reserves (IOER) by another 25 basis points, the spread between U.S. rates and global rates would widen even more. O’Driscoll points out such an action will attract capital to the U.S., thus raising the exchange rate of the U.S. dollar, slowing domestic business activity when the economy barely growing anyway. Moreover, the Fed appears to be struggling to even keep short-term rates as high as they are. As O’Driscoll notes, in December 2015 the Fed raised interest on excess reserves from 25 to 50 basis points and also posted an offering rate of 25 basis points on reverse repurchase agreements. The Fed’s mysterious reverse-repo program has expanded to $321 billion at recent count, as it tries to sop up enough cash to prevent even lower rates. But the Fed is battling the tide. O’Driscoll notes interest rates on short-term treasury bills (4 weeks) have recently traded down close to or even below 25 basis points. Of course, long-term rates are primarily set by market forces, and 10-year Treasuries have been yielding near record-lows, now offering about 1.50% interest. “There are real questions as to whether further hikes in what are administered (not market) interest rates will move market interest rates as desired. We have no experience on which to base such a forecast,” intones O’Driscoll. Well, bring it on, I say. Like what? In the past O’Driscoll has called for free banking, or a gold standard, and noted that modern-day central banks are aligned with nationalist malignancies of financing wars, empire-building, welfare-ism, oppressive state seizure of private assets and inflation. Maybe all true in the past, but what about inflation since 1982 or so? In the last 35 years the direction of interest rates and inflation internationally has been down, under globalist central-bank management. Indeed, much of the planet is now in deflation, and the U.S. but one recession away from joining the world. As Milton Friedman noted, you don’t get to chronically low interest rates through chronically easy money. For 30 years we have heard doom from inflation-mongers, and now we have global deflation. If central banks have an inflationist agenda, they are even more incompetent than we suspect. The admirable Alt-M team still discusses fiat-money central banking as having statist-inflationary agenda. Yet the Alt-M perspective appears out of date, by a few decades. Maybe free banking or a gold standard will work better than globalist central banking. But unlike O’Driscoll, I think the problem is globalist fiat-money central bankers are obsessed with inflation and not economic growth. The ECB, for example, appears intent on crushing nations, not promoting statism. Indeed, for now it would be better if a modern-day Korekiyo Takahashi (Japan’s central banker who ended the Great Depression on the islands) seized the Fed and sent in the helicopters. Darken the skies, and don’t stop until we see robust real growth and inflation north of 4%. Of course, Market Monetarists contend the practical path forward is central-bank NGDPLT. It may actually happen. The Alt-M crowd offers plenty of food for thought, but perhaps some updating is needed. Under the stalwart but still cautious leadership of Governor Haruhiko Kuroda, the Bank of Japan has followed a path of quantitative easing, and then negative interest rates, in a mixed battle against deflation and a soaring yen. Yet in mid-August the yen rose to less than 100 per U.S. dollar, from 120 at the start of the year. Meanwhile, Japan plays peek-a-boo with deflation. And now the Bank of Japan may be running out of Japanese government bonds to buy. With the BoJ having purchased one-third of the national bonds outstanding, the largest banks in Japan say they are running out of inventory. Moreover, the BoJ has been buying exchange-traded funds (ETFs). “Already a top-five owner of 81 companies in Japan’s Nikkei 225 Stock Average, the BOJ is on course to become the No. 1 shareholder in 55 of those firms by the end of next year, according to estimates compiled by Bloomberg from the central bank’s exchange-traded fund holdings,” reported Bloomberg recently. No doubt, critics will cite Japan as an example that QE does not work. But we don’t know the counter-factual, and it is probable Japan would have sunk into recession-deflation without QE. But perhaps the long-term critics of QE, who have predicted inflationary holocausts for years, finally have a real issue: The BoJ will run out of securities to buy. Although in a laughable twist, the BoJ will run out of securities to buy long before it “runs of out ammo,” says one of the other long-standing if insane critiques of QE. The BoJ has unlimited ammo. Though rarely discussed in U.S. macroeconomic circles, Japan used helicopter drops successfully in the Great Depression, under the leadership of Finance Minister Korekiyo Takahashi. While American and Europe remained mired in depressions until WWII, Japan’s economy grew solidly from 1932 to 1936, when Korekiyo was assassinated by militarists. The island economy kept growing thereafter, but ran into inflation, as the soldiers kept printing money to finance wars. Who in 2008 could have predicted that central-bank quantitative easing programs on three continents would be met by whimpering bond markets, zero-lower bound and borderline deflation through much of the developed world? Who can deny that the Bank of Japan has paid off one-third of the once-towering Japanese national debt, with no inflationary consequence? So what is the importance of the national debt in this new context? What recourse has the Bank of Japan now, but to ponder helicopter drops? Orthodoxy and convention have nearly ossified the craft of macroeconomics. Practitioners genuflect to totems even as events make a mockery of the most exalted maxims. Do the Rube Goldberg operations of the Federal Reserve, with bond-buying and selling, and reverse repos, and interest on excess reserves, and erratic posturing by various unelected regional bank presidents, make more sense than a simple program of money-financed fiscal programs? It is quite unfortunate that Schacht’s lesson was lost while Eucken’s paradigm carried the day. Schacht’s programme resembles a variation of the ‘helicopter money’ policy and its free-lunch effects (Bossone 2016), which several economists today consider an effective demand management tool for fiscally constrained economies trapped in deep depression. Market Monetarist don Scott Sumner has indirectly responded to Ed Yardeni’s surmising that it is secular stagnation and weak demand that is causing the crummy U.S. productivity stats. Sumner notes official unemployment rates have been falling, hard to square with sluggish AD causing schlumpy productivity. 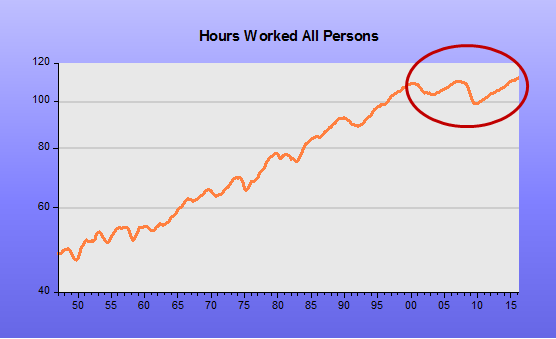 But what if I told you Americans are working about the same number of hours in aggregate today as in 2007…and in 2000? For Q1 2016, the index of hours worked nationally in the United States private sector was 112.3. It was 110.2 in Q2 2007, and 109.2 in Q2 2000. That is 16 years of essentially no employment growth in the United States. There is plenty of capacity, even in labor, on the sidelines. And above is output per hour. It flat-lines after 2010. So, as a nation, Americans are working about as many hours as 16 years ago, and output per hour has not risen much in the last six years. Does that strike anyone as an era of robust AD? The last 16 years sure looks like an economy limping along. Maybe a surge in aggregate demand—helicopter drops, for example—would not boost productivity, and would only boost employment and total hours worked. Boy, what a terrible outcome! Or maybe productivity is sluggish as labor is cheap. Employers just add some bodies on to meet the small increases in demand. As a counter-example, if the U.S. eliminated the minimum wage, it is likely productivity would drop, even as employment surged. But aggregate demand could stay weak, even with the decrease in unemployment. The truth is, aggregate demand is weak globally, which is why economies everywhere are waterlogged with capacity, especially China and Japan, which have built up exporting industries to service world markets. If global aggregate demand is weak, does that not suggest a universal condition, such as tight major central banks? Ed Yardeni, of Yardeni Research, is one of those names that have banged around U.S. macroeconomic circles for generations, always grounded in the numbers for his observations. So why the cruddy productivity numbers of late? Lots of capacity. There are lots of industries and companies with too much unproductive capacity. Some have expanded too much with the help of cheap credit. Some have been disrupted by competitors using new technologies. I just can’t find too many industries that haven’t spent enough money on plant, equipment, and technology. Indeed, the industrial capacity utilization rate has dropped to 75.4% during June from a recent peak of 78.9% in November 2014. What’s puzzling is that the employment rate (which is the flip side of the official unemployment rate) has risen to 95.1% from 94.2% over this same period. Yardeni is correct, the world is glutted with capacity, a glut that appears to be worsening, and also glutted with capital to make new capacity if needed. Yardeni is right that weak demand will drive down output per worker. It may also be that labor is cheap enough in the USA—with people returning to the labor force—that raising productivity is not a priority for American businesses. Central Banks Out of Ammo? Seeing what the federal government accomplishes, domestically and offshore, many fear more federal spending as a form of stimulus. That throws stimulus-backers back on our central bank to boost demand. With interest rates low already, likely lowering rates more can only do so much, although they should be lowered. The real choices come back to QE or helicopter drops. The Fed is not out of ammo, but it lacks resolve. What to make of it when a Michael Woodford, or a Ben Bernanke, or a Lord Adair Turner says helicopter drops will work—but the Fed will not send in the choppers? Bernanke says chopper drops will work, but should be a last resort. But why not now? What is the point of perennially soggy growth and low productivity, and the Japanification of the Western World? Why not a few years of boom times, and then deal with whatever inflationary consequences there may be, if any? Fed officials speak copiously and continuously about their unfulfilled urge for higher interest rates. This is a deep desire that U.S. central bankers were able to somewhat satiate from the early 1980s to 2008. It is true that through much of the 1980-2008 period many Fed-rate increases led to lower inflation, and to weaker growth and sometimes recession, leading to lower interest rates. Rates were in long-term secular decline, but there were those euphoric passages (for central bankers) when rates could again be boosted, as during any economic recovery. But, as Milton Friedman noted, 1) a central bank cannot tighten its way to higher interest rates forever, and 2) nominally low interest rates are a sign that money has been tight. A couple generations of money-tightening has produced predictable results of low interest rates, low growth, as well as miniscule inflation. The Fed is presently trapped. The central bank has little grip on long-term rates, now near historic lows. So raising the Fed funds rate and interest on excess reserves (IOER), will only dampen long-term rates again, the opposite of what the Fed says it wants. And then there is the tar baby the Fed tossed into the corner into which it then painted itself: IOER. Banks make money “on the spread,” that is the difference between borrowing costs and lending returns, usually about 300 basis points. Banks have overhead, labor costs, fancy HQs so that spread gets cut thin on the way to the bottom line. But now banks collect 0.50% on IOER, the same reserves hugely swollen by QE. The Fed is eager to boost that to 0.75% soon, and possibly even higher in the 12 months ahead. At some point it will make sense to banks to do nothing. IOER may be one reason why U.S. commercial real estate loan volume only reached 2007 levels again in late 2015. Actually, 2016 has been a decent year for commercial real estate loan volume—finally eclipsing 2007 levels—but if the Fed raises IOER again, perhaps the IOER will be higher than the profit on a commercial property loan. The banks can go golfing on the 0.75% they make for keeping money in the vault. Nirvana for central and commercial bankers at last! Yet this problem of IOER-addled banks is doubly important, as many say it is banks that expand the money supply, when they extend a loan. Before QE, the main creation of new money was through bank lending, and banks primarily lend on real estate. This gets into the whole exogenous v. endogenous expansion of the money supply dispute, which can put any sane person into knots for days. But suffice it to say, the Fed is following a reckless and suppressive mission with a view towards higher IOER. The money hose could run dry long before the Fed could arrange tools to replenish the supply. Paying banks to do nothing is an imprudent and dangerous precedent, and of course, only banks will closely monitor and lobby this IOER issue going forward. Like any federal dope, it will quickly become addictive. The Fed likely should have never paid IOER. But what is done is done. This makes the quantitative easing (QE) option going forward more problematic, as banks will accrue even more indolence-inducing reserves. But the US will enter recession again someday, and likely with interest rates near or lower than today’s levels. Really, the only recourse is to the helicopters. And that begs the question: Why wait until there is a deep recession again? How about preventative air drops anytime core-PCE dips below 2% YOY? Or, better yet, whenever NGDP growth drops below 5%? House prices feed heavily into U.S. inflation rates as measured, and as pointed out by Kevin Erdmann of the excellent blog Idiosyncratic Whisk, there is hardly inflation at all but for housing costs. The matters little for U.S. Federal Reserve officials or the gaggle of inflationistas who monomaniacally jibber-jabber about prices. At every juncture, monetary policy is about the perils of inflation and the need to raise rates. But, as noted by many, from here the Fed cannot tighten its way to higher long-term interest rates. The United States is in that monetary zone long ago noted by Milton Friedman: Interest rates are low as a consequence of tight money. The present-day reality is this: Easy money for years on end does not lead to sub-2% 10-year US Treasuries, which we see in the market now. And Fed policy gets more confounding. If the Fed raises rates, it will only succeed on the short-end of the curve. As money is already tight, long-term rates will sag, and that includes long-term mortgage rates. Okay, so lower long-term mortgages rates, ceteris paribus, lead to higher house prices and thus higher rents, as rents are tried to house prices. Of course, the real solution to high housing costs in the United States is twofold, involving aggressive upzoning or dezoning of property in high-cost cities, and a looser money policy and extension of credit to home-building industries and buyers. An aggressive pro-growth monetary policy might actually result in prosperity and higher long-term rates. Oddly enough, the higher mortgage rates might somewhat depress house prices and related rents, which feed into reported inflation. As it stands, there is little the Fed can do about property zoning, which is a local prerogative. At the last Fed shindig in Jackson Hole, every panel discussion was about inflation, but none mentioned property zoning. I would call this a blind-spot, but that would suggest the Fed has eyes. In any event, the U.S. property-owning class in each city seems content to zone out competition, and is politically powerful. In the real world, prosperity in the United States will incur moderate inflation, in large part due to housing costs. The Fed’s chosen solution is to prevent prosperity, but that is a central banker’s fix and not a good one. The Fed’s better recourse from here is to shoot for higher long-term growth and interest rates, and moderate inflation, by any means necessary, including helicopter drops. Of course, the best course is targeting NGDPLT. The Fed is likely to enter the next recession with interest rates near the zero-bound and inflation dead. Then what?